The Dutch contribution to the 16th International Architecture Exhibition of La Biennale di Venezia, will travel to Het Nieuwe Instituut in Rotterdam. Over the last year, a group of architects, artists, designers, historians, musicians, theorists and institutions have contributed to a transnational research that manifested in the Dutch Pavilion: WORK, BODY, LEISURE. Next to the exhibition and program in Venice, the project commissioned by Het Nieuwe Instituut and curated by Marina Otero Verzier, has seen manifestations in publications, podcasts, performances, new research initiatives, exhibitions and long-term exchanges. This collaborative endeavor seeks to foster new forms of creativity and responsibility within the architectural field in response to emerging technologies of automation. A domain of research and innovation that, despite its ongoing transformation of the built environment and bodies that inhabit it, is still largely devoid of a critical spatial perspective. Following a closing program in the Giardini on 24 November, the exhibition WORK, BODY, LEISURE will travel to Het Nieuwe Instituut in Rotterdam, where it will be open to the public from 21 December. The installation will chart a journey through a series of architectures in the Netherlands and beyond in which bodies are categorized and transformed: offices, playgrounds, farms, factories and virtual spaces, windows, beds, and doors. Scenarios that look familiar—if rarely accessible or seemingly banal—but are nevertheless at the epicenter of the transformation of labor. On 17 January, 2019, a series of performances by Krump dancers will activate these architectures and their stories, while spawning yet new questions around automation. Building upon the long-term research on changing labor ethos and conditions, Het Nieuwe Instituut has embarked on a new initiative around the theme of BURN-OUT. The project addresses the exhaustion of a growing number of human and other bodies, as a symptom of the presence of exploitative structures within society, throughout institutional, political and biological ecologies. In addition to this year’s fellowship program, a series of activities and collaborations will shape a public program organized around notions of and counteractions to burn-out. The book Work, Body, Leisure, presented in conjunction with the Dutch Pavilion, explores the spatial configurations, living conditions, and notions of the human body engendered by disruptive changes in labor, its ethos, and its conditions. Selected essays are available in the project’s web magazine. Het Nieuwe Instituut partnered with the Serpentine Galleries for the 2018 Work Marathon. In the episode Invisible Labour, part of the Serpentine Podcast: On Work series, Marina Otero Verzier chairs a conversation about labor in an interspecies and posthuman landscape. Participants include Amal Alhaag, Patricia MacCormack, Susan Schuppli and Noam Toran. On September 22, Beatriz Colomina held conversations addressing the bed as a contemporary workplace. Interviewing London-based architects from her own bed inside the Serpentine Pavilion 2018, Colomina’s performance echoed Yoko Ono and John Lennon’s historic 1969 ‘bed-in,’ and followed the bed-in interviews that took place at the Dutch Pavilion in Venice during the opening days. The Serpentine’s Work Marathon was curated by Hans Ulrich Obrist, Claude Adjil, Lucia Pietroiusti, Kostas Stasinopoulos, Ben Vickers, and Kay Watson. Useful Life is a podcast series about obsolescence and revitalization, recorded during the opening days of WORK, BODY, LEISURE. One of the premises of the debates around automation is that the implementation of these technologies render (non)-human bodies and spaces obsolete. Yet, automation processes may also revitalise or create new ones. In unscripted conversations, René Boer and Arif Kornweitz explore these questions together with Amal Alhaag, Floris Alkemade, Gonzalo Herrero Delicado, Marten Kuijpers, Víctor Muñoz Sanz, Simone Niquille, Northscapes Collective, Liam Young, Mark Wigley, Katía Truijen, among others. From its main port in Rotterdam, to its productive hinterlands, the logic and relations that define the physical and social landscape of work and labor in the Netherlands are being redefined by machines, data and interfaces. Automated Landscapes, invited students and professionals to join a series of field trips to these emerging territories of automated dairy farms, greenhouses, data centers and and submarine cable landing points: The Countryside Tour and The Data Centers Tour. On November 22, Meiny Prins, Susan Schuppli, Stephan Petermann, Víctor Muñoz Sanz, Marina Otero Verzier, Marten Kuijpers and Arjen Oosterman will engage in a public conversation on the spatial implications of automation for the built environment. This Fall, the Institute of Patent Infringement by Matthew Stewart and Jane Chew traveled to the V&A for the London Design Festival, as well as to Het Nieuwe Instituut. The project invites questioning of the dubious world of intellectual property rights, which allows “Big Tech” multinationals to create a monopoly on ideas concerning automation. Focusing on the political dimension of labor, architects are encouraged to appropriate the frameworks under which these multinationals operate, revealing a possible radical and emancipatory potential inherent in these technological regimes, as well as a space where architecture could play a role. Songs for Hard Working People by Noam Toran with Remco de Jong and Florentijn Boddendijk is a contemporary cover album of work and protest songs from the mid-19th to mid-20th centuries, and serves as the soundtrack for WORK, BODY, LEISURE. The songs provide a historical context for the nature of today’s labor and connect past but enduring struggles with contemporary debates regarding the effects of industrialization and automation on the working body. On August 23, Paolo Patelli, Giuditta Vendrame and Giulio Squillacciotti hosted a conversation on the everyday spaces and gestures of seafarers, with organisations and individuals who contributed to, inspired or informed the realisation of the video installation Shore Leaves, part of WORK, BODY, LEISURE. The event took place in the Norsk Sjømannskirke, the Norwegian Church in Rotterdam, a former seamen’s club. Simone Niquille’s installation Safety Measures will be presented at the 6th Guangzhou Triennial as part of the Evolutions of Kin exhibition curated by Angelique Spaninks. The installation will be on view from December 21, 2018 in the Guangdong Museum of Art. WORK, BODY, LEISURE was presented in lectures, seminars and debates by curator Marina Otero Verzier and assistant curator Katía Truijen at the Royal College of Art, The Royal Academy of Arts, The Building Centre (London), AZ Nights at Z33 (Hasselt), Art Basel Hong Kong, The XXII Triennale di Milano, Broken Nature Symposium, and Arcam (Amsterdam), among others. 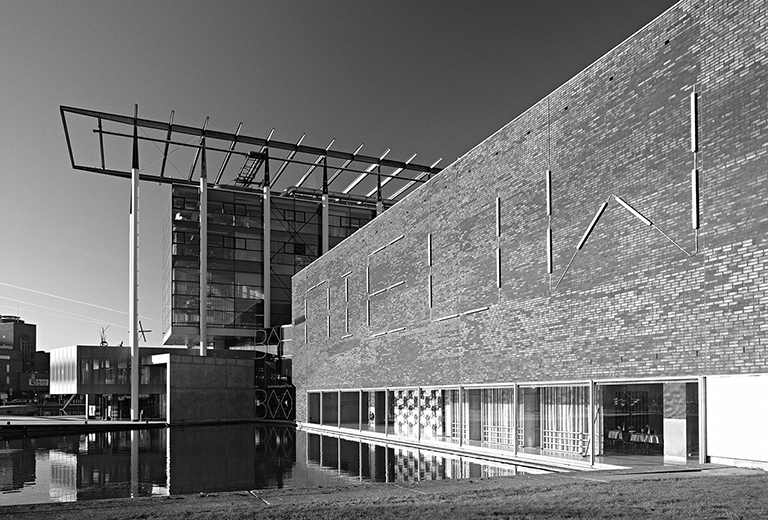 For more information and press images please contact Silvie van Oost via email: s.vanoost@hetnieuweinstituut.nl or telephone on +31 (0) 6 57 98 13 88.